Sitting on the floor, I stared absently across the room at the curtains. 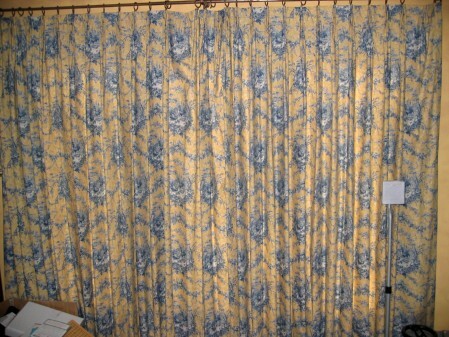 The mildy tacky yellow and blue floral curtains, whose print pattern was shared by all the living room furniture of the previous owners, whose loud, awkward coloring has stained the aura of our living room for over two and a half years. “Are those…”, I stuttered, “…chickens? !”, I exclaimed as I rose to my feet, alarmed. Leslie, nearby and only dimly aware of my stirring, muttered a disengaged “uh-huh”. 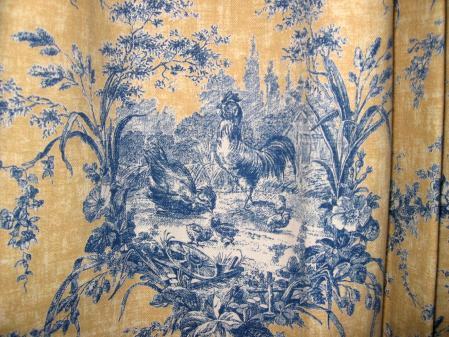 I went to the curtains and stared into one of the blue splotches that covered it’s surface. Much to my horror, I saw a rooster. A rooster, a hen and four chicks. pmsl! You mean you had CHICKEN curtains for 2 1/2 years and never noticed? It has recently been brought to my attention that I made a bag out of the same fabric as your curtains. So there’s a real “chicken bag” for your husband. Is it true that I have made an Amy Butler bag out of hopelessly square fabric? I hope (hopehopehope) my aunt likes it. LOL! That’s hilarious. It’s funny what we don’t see isn’t it? ?